I have long suspected that with oceans warming due to carbon pollution organized tropical systems are starting to appearing sooner and disappear later, thus expanding tropical seasons worldwide. 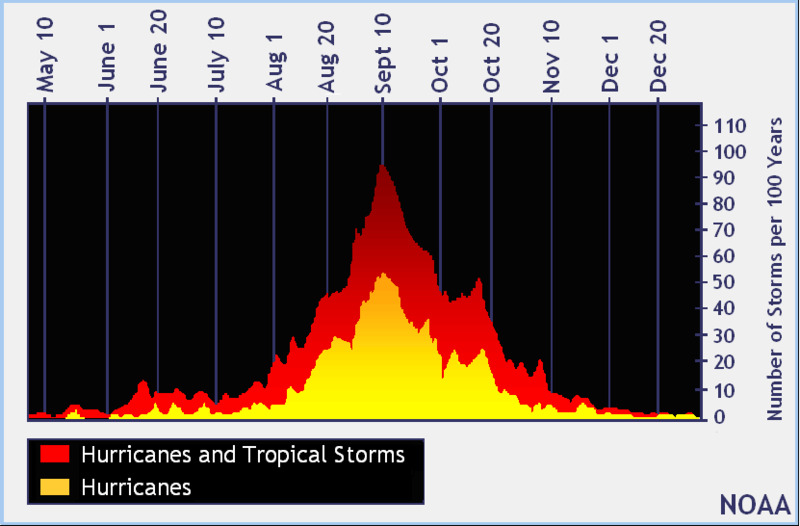 In the Atlantic Basin the “official” hurricane season begins June 1st and ends November 1st. What I have witnessed this century leads me to believe that this time frame will need to be expanded. This year we may have another early case potentially causing some damage mainly from flooding in the United States. (2/2) Regardless of development, the area will receive plenty of rain this week! 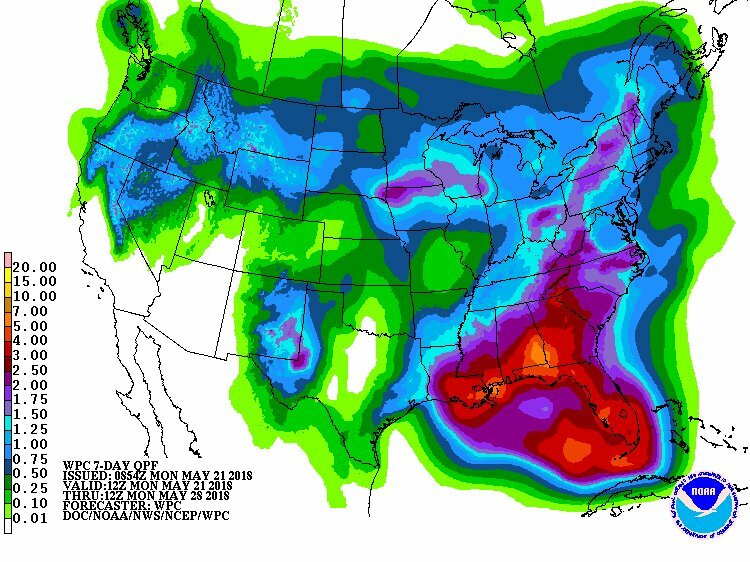 7 day rainfall graphic from @NWSWPC shows 3-7″ possible thru Sun night. 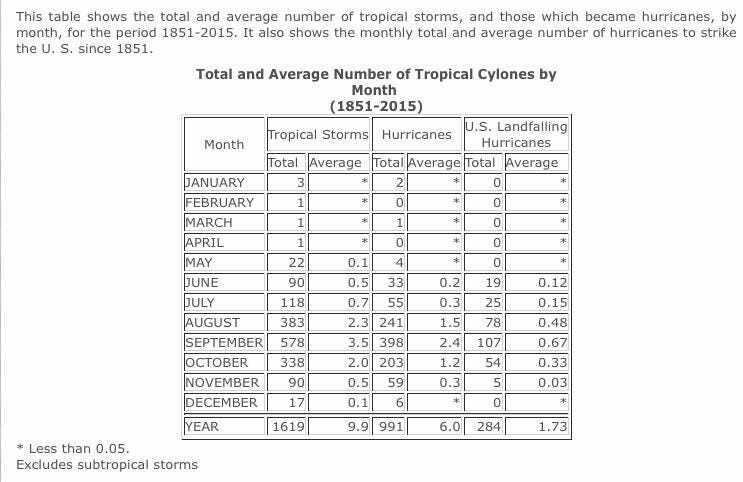 Since 1851, we’ve recorded 32 Atlantic tropical cyclones during the month of May. Most have formed in the western Atlantic or Caribbean, w/ very few in the Gulf. Only 4 hurricanes have been recorded in May, with no May U.S. hurricane landfalls. The last two years we had early systems, Bonnie as a tropical storm in May 2016, and Bret as a subtropical storm in April 2017. In fact, during the planets warmest year on record in 2016 we had a January hurricane, Alex. 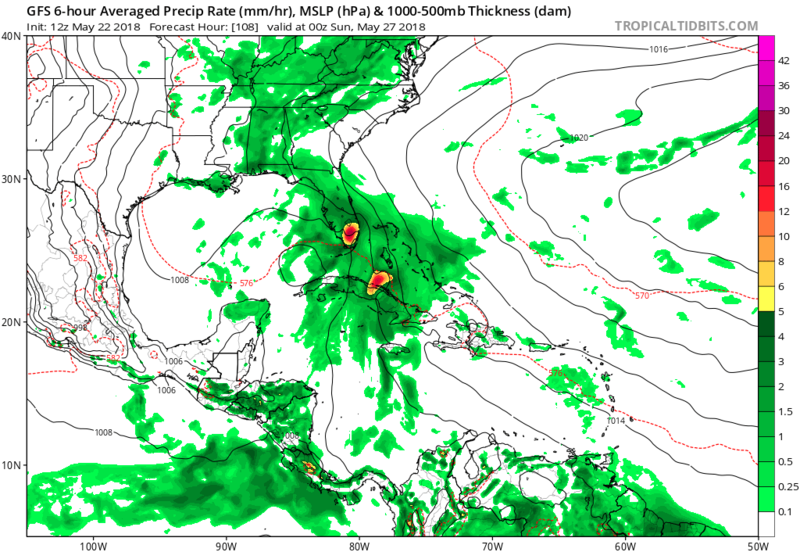 The strangest hurricane season I witnessed was that of 2005 when Greek letters had to be used for named storms well into January of the following year with Tropical Storm Zeta disappearing on January 6th, 2006. Don’t forget 2005 was when Katrina occurred. Lowry’s estimates, using data at this link, include recent years, but a table on the NOAA Hurricane Research Division website counts the number of tropical storms and hurricanes from 1851 to 2015, and it is clear that May storms are somewhat rare but not impossible. Weather Underground provides an excellent list of early season hurricanes by name. Typically, hurricanes form later in the season because it takes the ocean water a bit longer to heat up to required temperatures to support them. I wrote in November about the notion of whether a “hurricane season” is becoming obsolete. Will there be a lot more catalogued activity on the edge of this chart due to warming seas? In the past decade, half of the Atlantic’s seasons had “preseason” storms. 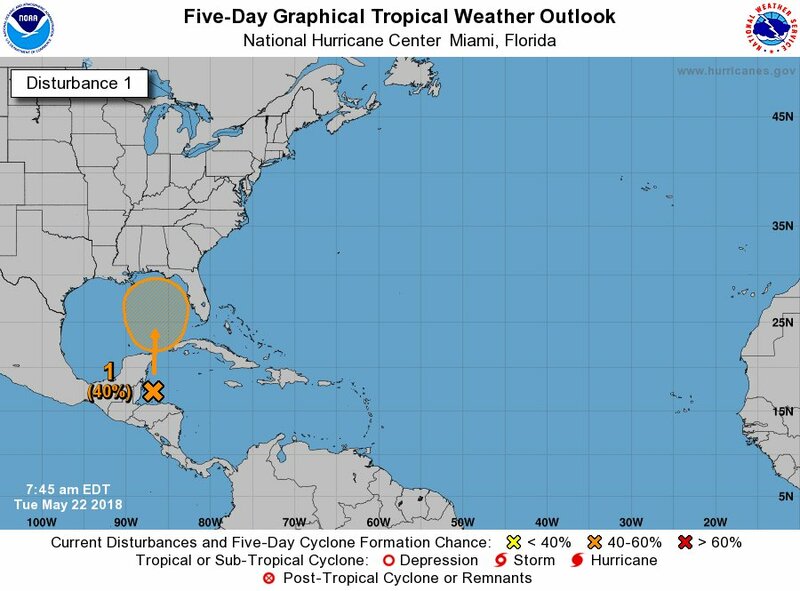 In 2012, two storms—Alberto and Beryl—were named before the season officially started. 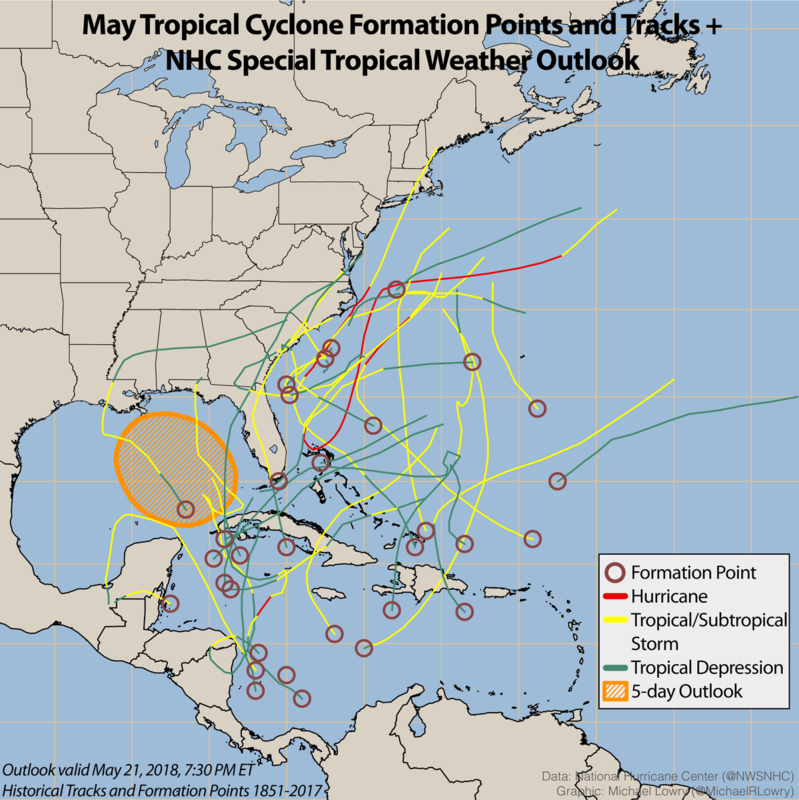 And last year, Ana formed east of Georgia on May 7. Granted, it was initially a subtropical storm, a hybrid with both tropical features and features of midlatitude cyclones. But waters were warm and Ana became fully tropical in just days, and moved ashore in South Carolina on May 10. Experts note that the current length was established in 1965 based on the formation dates of 97% of tropical cyclone activity in the basin. However, research published in Geophysical Research Letters by Jim Kossin at the University of Wisconsin found that warming sea surface temperatures were leading to more “pre” and “post” season storms. A more recent study the Journal of Meteorological Research investigated relationships between sea surface temperatures and early onset. A 2017 study in the Journal of Climate found relationships between El Nino and the tropical cyclone season onset in the Pacific basin. Such research and “common sense” observations of what is happening recently suggest that continued research into roles of natural variably and possible human-related is warranted. This week will be interesting. I will post updates as warranted.